"No no, not Janey Briggs! She's got glasses. And a ponytail!" "Really, specs? And suddenly she's not the most beautiful woman you've ever seen?" There is one favorite Hollywood method to change a character's appearance massively without having to actually change the actor's appearance to unrecognisable levels. A ponytail, and a pair of glasses. The superficial features of the character's appearance have been changed enough that the Willing Suspension of Disbelief is not broken when other characters don't recognise them, but for most viewers they are still obviously the same character. The idea became so prevalent that it also moved to non-visual media, with the glasses-and-ponytail being an indicator of plainness. Adding or removing these items to/from a girl may be used as a disguise, with removing them also being used to clean up nicely. Most typically used as a form of Paper-Thin Disguise or for She Cleans Up Nicely (the glasses and ponytail look usually invokes Hollywood Homely). Usually Always Female, but not necessarily. In either case, glasses and ponytail (or really any style that does the hair up one way or the other) is a stock 'coverup' used and enforced to make a character (recognisably) unrecognisable. See also The Glasses Gotta Go (an ugly girl with glasses discovers that she looks better without them), Long Hair Is Feminine (since a ponytail would be perceived as less feminine), Tomboyish Ponytail, and Shaking Her Hair Loose / Letting Her Hair Down. Fullmetal Alchemist: Riza Hawkeye puts on a pair of glasses and lets her hair down for her civilian disguise as "Elizabeth." Ranma Saotome from Ranma ½ has this as one of his favorite disguise methods and it almost always works due to everyone around him being clueless and gullible, especially Ryōga. During The Surtur Saga story arc of The Mighty Thor, Thor couldn't turn into his usual secret identity of Donald Blake, so he had to do the ponytail-and-glasses thing to become "Sigurd Jarlson", a construction worker from Norway. Supergirl dons the ponytail-and-glasses disguise in several continuities. In Supergirl (Rebirth), she improves the disguises with a holographic device which changes her hair color. In Cracked Magazine issue 137, "Beach Blanket Party" was a parody of the old beach movies (guest starring The Fonz). When the "homely" girl is transformed per this trope, she explains that she followed the usual formula — took off her glasses, let her hair down... and then let a stand-in actress take over! Played with in Cloudy with a Chance of Meatballs. Samantha "Sam" Sparks was a bit of a geek as a child, and she had glasses and a ponytail. 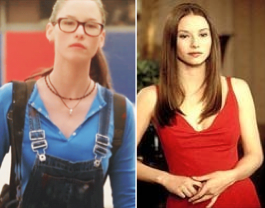 When people made fun of her for her demeanor, she started trying to hide her intelligence, and stopped wearing glasses and putting her hair in a ponytail. When she meets Flint and begins to reveal her true colors, he appreciates her for who she is, convincing her to regain the glasses and ponytail. Parodied in Not Another Teen Movie, with Janey Briggs being the most unattractive girl ever for having glasses and a ponytail, with everyone reacting appalled. When her date's sister pseudo-erotically removes them, everyone reacts as if she has become the most attractive girl in the world, and asking who she is at prom. Discussed in Wonder Woman when Diana arrives in London and Steve wants to give her glasses and tie her hair up. Etta comments how basically nothing could disguise the fact that she's got to be the most beautiful woman in the world, and Diana quickly shucks the glasses and lets loose her hair, remaining disguise-less for most of the action. In The Brady Bunch episode "My Fair Opponent", Marcia transforms ugly duckling Molly Webber into an attractive girl by doing just that. In Dark Justice, Judge Nicholas Marshall wore his hair this way on the bench, with the requisite glasses. When ready to engage a high-level criminal who invoked Loophole Abuse to beat the rap, the glasses came off and the hair came down. MacGyver (1985): Mac would don glasses and pull his hair back in a (rather short) ponytail when he went undercover as computer nerd Dexter. Supergirl (2015): It is frequently mentioned by those who know Kara/Supergirl's dual identity that her disguise is not good, especially with Cat mentioning that when you work with someone (that you know the morals of, at least) it's really easy to distinguish their features. However, Kara's boss after Cat, Snapper, calls her only by the nickname "Ponytail", which reinforces the idea that he reduces people to a predominant defining feature and won't look beyond the hair or glasses. When Stacy Keibler was in WCW, she wore glasses and her hair in a bun when she was Miss Hancock, but would have her hair down and no glasses as Nitro Girl Skye. In El Goonish Shive, Ellen wears sunglasses and her hair in pigtails plus a baseball cap to disguise herself. This proved to be so effective, many readers were thrown off by her appearance leading Dan to add narration and mention it in The Rant. Superman: The Animated Series: When Supergirl moves to Earth she creates per her cousin's advice a secret identity wearing glasses and her hair in a ponytail.